Originally from Wiltshire, England, we are Carole and Patrick Head and, along with several cats and a dog, we live at and run La Fosse, a chambres d’hôte (French bed & breakfast) in the village of Perriers-en-Beauficel, Manche, Lower Normandy. So where’s that exactly ? We’re at the bottom of the Cotentin peninsula – the bit of France that has Cherbourg at the top. We’re just under two hours from Cherbourg, in the rolling hills of the Normandy bocage – wooded countryside. We’re inland from Avranches, in the hills above a valley that runs from the baie du Mont-Saint-Michel to Mortain. La Fosse is within a short drive of the market towns of Sourdeval, Vire, St Hilaire du Harcouët and Mortain and a little further away are the towns of Villedieu les Pôeles, Avranches and Granville. Or, if you want to contact us, email carole.head @ gmail.com – remove the spaces before and after the @ to make the address work. Or post a comment via the blog comments box at the bottom of this post. It’s always a pleasure to hear from people who’ve found this blog. 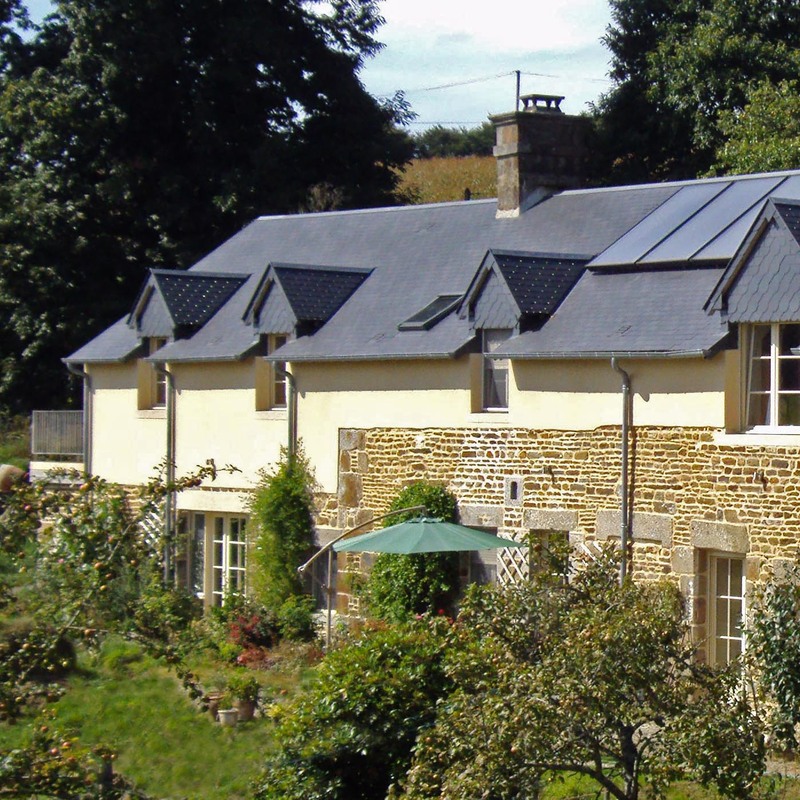 La Fosse is situated a few minutes outside a small village and is surrounded by cider apple orchards and pasture-land with sheep and cattle. The land is fed by springs which wend their way down the hillside to the River Sée, one of the area’s small but healthy trout rivers. If we take the time – and have the patience! – to look and watch, we are rewarded with good views of a variety of wildlife. The area is good for wildflowers too, especially along the grass verges during early summer. Yes, the local hares, deer, occasional wild boar and the like are spectacularly enjoyable but spotting the smaller, less obviously exciting wildlife is equally interesting. Last year, moving a wood pile, we found a midwife toad with eggs. A midwife toad is actually a male toad who – when Mrs Toad has spawned the eggs and he’s fertilised them – carries the eggs wrapped round his back and legs in a long string until they’re ready to hatch – at which time he goes down to the pond and deposits the spawn for the tadpoles to spend the next 6+ months of their life in the water. Each summer, the midwife toads make themselves heard over the sound of the crickets with their “peep… peep…” calls. We’d figured out what animal was making the sound but hadn’t managed to track the call to the source. So when we found one unexpectedly the excitement was someone spoilt by the fact the toad had managed to successfully hide itself before I managed to find the camera. The butterflies can be spectacular. Outside La Fosse’s front door, we have a selection of buddleia bushes planted up on the bank. 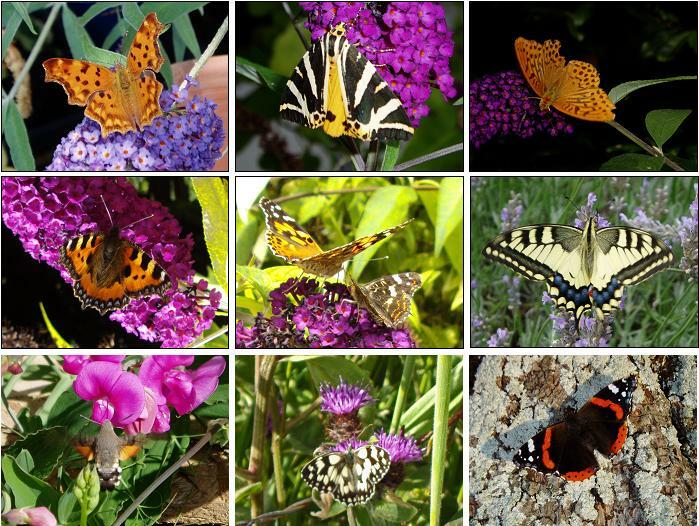 The sheer volume of butterflies, daytime moths and bumblebees on sunny afternoons has to be seen to be believed.